As I've mentioned in February 2013, I started using mutt in December 2012 and as a transitional state, I've been using my three IMAP accounts in on-line mode, like I did with KMail. All outgoing mail got recorded in an mbox file called ~/Mail/Sent for all three accounts, which was not intentional, but a configuration glitch at first. But now I realized that it has two positive side effects when I'm using cellular Internet connection. Since this way, the MUA doesn't upload the message using IMAP to the Sent folder, resulting in 50% less data sent, which makes sending mail faster and saves precious megabytes in my mobile data plan. However, I still prefer having my sent mail present in the Sent folder of my IMAP accounts, so I needed a solution to transfer the contents of an mbox file to IMAP folders based on the From field. I preferred Python for the task as the standard library had support for both IMAP and mbox out of the box, and I've already had good experience with the former. Many solutions I found used Python as well, but none of them had support for multiple IMAP accounts and many used deprecated classes, or treated the process as a one-shot operation, while I planned to use this to upload my mbox regularly to IMAP. So I decided to write a simple script, which I completed in about an hour or two that did exactly what I need, and still had no dependencies to anything that's not part of the standard library. The script has support for invocation from other modules and the command line as well, core functionality was implemented in the process_mbox method of the OutboxSyncer class. The method gets the Mailbox object and a reference for a database as parameters, latter is used to ensure that all messages are uploaded exactly once, even in case of exceptions or parallel invocations. The built-in iterator of the mailbox is used to iterate through messages in a memory-efficient way. Both key and msg are needed as former is needed to obtain the raw message as a byte string (contents), while latter makes parsed data, such as the sender (account) and the timestamp (date_time) accessible. The contents of the message is hashed (currently using SHA-256) to get a unique identifier for database storage. In the last line, params is instantiated for later usage in parameterized database queries. By using the context manager of the database object, checking whether the message free for processing and locking it is done in a single transaction, resulting in a ROLLBACK in case an exception gets thrown and in a COMMIT otherwise. Assigning the variable count was done this way to assert that the result has a single row with a single column. If the message is locked or has already been uploaded, the mailbox iterator is advanced without further processing using continue. After the message is locked for processing, it gets uploaded to the IMAP account into the folder specified in the configuration. The class has a get_imap_connection method that calls the appropriate imaplib constructors and takes care of connection pooling to avoid connection and disconnection for every message processed. The return value of the IMAP server is checked to avoid silent fail. 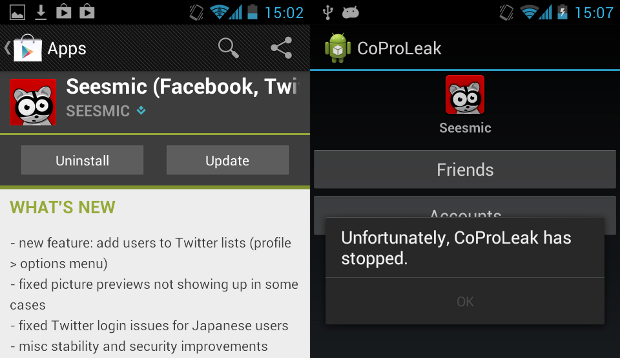 In case of errors, the message lock gets released and the exception is re-raised to stop the process. Otherwise, the success flag is set to 1, and processing continues with the next message. Source code is available in my GitHub repository under MIT license, feel free to fork and send pull requests or comment on the code there. Lately I analyzed a closed-source proprietary thick client application that rolled its own cryptography, including the one used for the network layer. To aid the protocol analysis, I needed two tools with a shared input. The input was the flow of packets sent and received by the application, which I first tried to extract using the hex output of tshark, but I realized that it displayed data from layers above TCP I didn't need, and on the other hand, it didn't perform TCP reassembly, which I didn't want to do by hand or reinventing the wheel. So I decided to use the output of the Follow TCP stream function of Wireshark, in hex mode to be precise. It can be saved to a plain text file with a single click, and it just had what I needed: offsets and easily parseable hex data. I've written a simple parser based on regular expressions that could read such file, starting by defining the actual expressions. The first one matches a single line, starting with whitespace in case of packets sent, and nothing if received (group 1). This is followed by a hex offset of the row (group 2), the row data encoded in 1 to 16 hex bytes (group 3), and the ASCII dump of the row data. Latter is padded, so by limiting group 3 to 49 characters, it could be ignored effectively. I used the re.I flag so I didn't have to write a-fA-F everywhere instead of a-f explicitly. The Flow class itself is a list of entries, so I made the class inherit from list and added a custom constructor. I also added an inner class called Entry for the entries and two constants to indicate packet directions. I used a namedtuple to provide some formality over using a dict. The constructor expects the name of a file from Wireshark, opens it and populates the list using the parent constructor and a generator function called load_flow. This load_flow got a file object, which it used as an iterator, returning each line of the input file. It got mapped using imap to regular expression match objects, and filtered using ifilter to ignore rows that didn't match. In the body of the loop, all three match groups are parsed, and sanity checks are performed on the offset to make sure to bytes were lost during parsing. For this purpose, a dict is used, initialized to zeros before the loop, and incremented after each row to measure the number of bytes read in both directions. The rest of the function is some code that (as of 14 March 2013) needs some cleaning, and handles yielding Flow.Entry objects properly, squashing entries spanning multiple rows at the same time. As I mentioned in the beginning, there were two kinds of functionality I needed, both of which use these Flow objects as an input. The first one is a fake client/server that makes it possible to generate network traffic quickly by using previously captured flows, called flowfake. It simply replays flows from a selected viewpoint using plain sockets, either as a client or a server. The second one is more interesting and complex (at least for me) as it makes possible to view the differences (or similarities, depending on the use-case) between 2 to 4 flows (latter being an ad-hoc limit based on the colors defined) using simple algorithms and colors to aid visual analysis. For better understanding, see the screenshot below to understand how it works on four flows. The whole project is available under MIT license in a GitHub repo. Burp Suite is the tool I'd feel lost without when testing web applications, we even bought the pro version, since it's a great tool with a low price tag. One of its great features is generating proof-of-concept HTML forms for Cross-Site Request Forgery (CSRF or XSRF) testing, and it usually just works out of the box. As it works using HTTP POST data, it has no information about the character-level encoding of the data, so when it comes to applications with accented characters (not a rare thing in Hungary), it just generates garbage, which needs to be fixed manually, but it's not a big problem. Since I really needed a working solution, I created a simple Python script to parse the XML export of a HTTP request from Burp and create an HTML page with a form that have values sent in the request preset. I used LXML to both parse the input XML and serialize the HTML output to avoid the pitfalls Burp met, and first, I loaded the Burp XML request file. XPath was used to get the first item (such exports can store more than one), and to extract the method, URL and request information. Using the single-element tuple assignment syntax asserts that the right-hand side of the assignment contains one and only one element, asserting the sanity of the input. Burp can encode the request body using Base64, so it should be checked for and decoded if necessary. The resulting body contains the HTTP headers and the encoded POST data, separated by an empty line, so splitting it is pretty straightforward. The second parameter of the split method stops after the first split, and naming the first result with an underscore makes it apparent for both humans and machines that we don't care about that piece of data. I wrote a small generator function that yields the names and values of each form field as tuples of Unicode objects. I initially used string manipulation, then discovered that Python had me covered with urlparse. With this done, I just had to build the resulting HTML. I used LXML's E-Factory and Python's argument list unpacking to make it happen in a more or less readable way. The complete and working script can be downloaded from my GitHub repository, and in case you've been wondering if it was worth it; yes, the PoC proved that the target application with the 150 KB ViewState was indeed vulnerable to XSRF. LibreOffice 4.0 got released on 7th February, and since it offered improved OOXML interoperability, I immediately downloaded and installed it on my laptop. It worked quite well, but after the next boot, it just flashed the window for a tenth of a second, and displayed the following output on the console. I symlinked /opt to /usr/local/opt, and for many reasons (including faster boot, storing /usr on an SSD) I mount /usr in read-only mode by default, and use the following snippet in /etc/apt/apt.conf.d/12remount to do the magic upon system upgrade and software installs. It seems that LibreOffice 4.0 tries to put compiled Python objects into a persistent cache, and since it resides on a read-only filesystem, it cannot even create the __pycache__ directories needed for that. My workaround is the following shell script that needs to be ran just once, and works quite well by letting LibreOffice put its cached pyc files into /tmp. In November 2012, I started doing Arduino workshops in H.A.C.K. and after I announced it on some local channels, some people asked if it could be recorded and published. At first, it seemed that recording video would require the least effort to publish what we've done, and while I though otherwise after the first one, now we have a collection of simple and robust tools and snippets that glue them together that can be reused for all future workshops. The recording part was simple, I won't write about it outside this paragraph, but although the following thoughts might seem trivial, important things cannot be repeated enough times. Although the built-in microphones are great for lots of purposes, unless you're sitting in a silent room (no noise from machines nor people) or you already use a microphone with an amplifier, a microphone closer to the speaker should be used. We already got a cheap lavalier microphone with a preamplifier and 5 meters of cable, so we used that. It also helps if the camera operator has a headphone, so the volume level can be checked, and you won't freak out after importing the video to the PC that either the level is so low that it has lots of noise or it's so high that it becomes distorted. I used a DV camera, so running dvgrab resulted in dvgrab-*.dv files. Although the automatic splitting is sometimes desireable (not just because of crippled file systems, but it makes it possible to transfer each file after it's closed, lowering the amount of drive space needed), if not, it can be disabled by setting the split size to zero using -size 0. It's also handy to enable automatic splitting upon new recordings with -autosplit. Finally, -timestamp gives meaningful names to the files by using the metadata recorded on the tape, including the exact date and time. The camera I used had a stereo microphone and a matching stereo connector, but the microphone was mono, with a connector that shorted the right channel and the ground of the input jack, the audio track had a left channel carrying the sound, and a right one with total silence. My problem was that most software handled channel reduction by calculating an average, so the amplitude of the resulting mono track was half of the original. Fortunately, I found that ffmpeg is capable of powerful audio panning, so the following parameter takes a stereo audio track, discards the right channel, and uses the left audio channel as a mono output. I also wanted to have a little watermark in the corner to inform viewers about the web page of our hackerspace, so I created an image with matching resolution in GIMP, wrote the domain name in the corner, and made it semi-transparent. I used this method with Mencoder too, but FFmpeg can handle PNGs with 8-bit alpha channels out-of-the-box. The following, combined command line adds the watermark, fixes the audio track, and encodes the output using H.264 into an MKV container. A cropped sample frame of the output can be seen below, with the zoomed watermark opened in GIMP in the corner. I chose MKV (Matroska) because of the great tools provided by MKVToolNix (packaged under the same name in lowercase for Debian and Ubuntu) that make it possible to merge files later in a safe way. Merging was needed in my case for two reasons. If I had to work with split .dv files, I converted them to .mkv files one by one, and merged them in the end. I wanted to add a title to the beginning, which also required a merge with the recorded material. I tried putting the title screen together from scratch, but I found it much easier to take the first 8 seconds of an already done MKV using mkvmerge, then placed a fully opaque title image of matching size using the overlay I wrote about above, and finally replace the sound with silence. In terms of shell commands, it's like the following. The first FFmpeg invocation disables audio using the -an switch, and produces title-img.mkv that contains our PNG image in the video track, and has no audio. Then mkvmerge splits it into two files, an 8 seconds long title-img-8s-001.mkv, and the rest as title-img-8s-002.mkv. Latter gets discarded right away, and a second FFmpeg invocation adds an audio track containing nothing but silence with a frequency (48 kHz) matching that of the recording. The -c:v copy parameter ensures that no video recompression is done, and -shortest discourages FFmpeg from trying to read as long as at least one input has data, since aevalsrc would generate silence forever. If you produced your input files using the methods described above, if it displays an error message, it's almost certainly the following (since all resolution/codec/etc. parameters should match, right?). As the error message suggests, the order of the tracks can differ between MKV files, so an explicit mapping must be provided to mkvmerge for matching the tracks befor concatenation. The mapping for the most common case (a single audio and a single video track) is the following. I've had a pretty good experience with H.264-encoded MKV files, the size stayed reasonable, and most players had no problem with it. It also supports subtitles, and since YouTube and other video sharing sites accept it as well, with these tips, I hope it gets used more in recording and publishing workshops. While the GPGME Python bindings provide interface to most of the functionality provided by GnuPG, so I could generate keys and perform encryption and decryption using them, I found that it wasn't possible to list, which public keys can decrypt a PGP encrypted file. 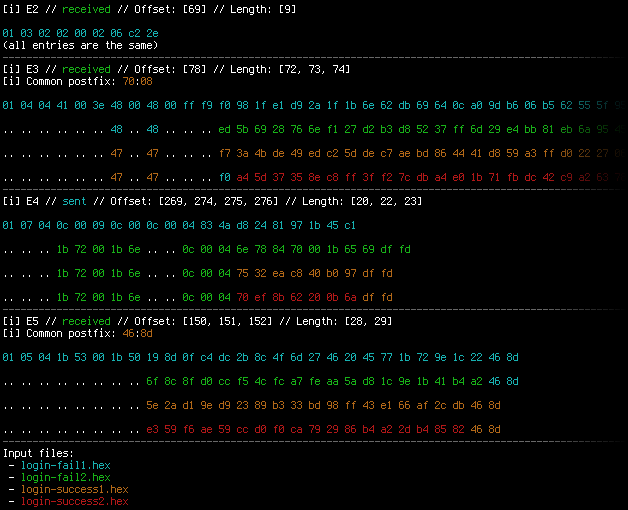 Of course, it's always a possibility to invoke the gpg binary, but I wanted to avoid spawning processes if possible. after returning the pke_packet instances, it raises an XXXError in case of OpenPGP output generated by GnuPG 1.4.12. It's also important to note that the M2Crypto keyid is an 8 bytes long raw byte string, while GPGME uses 16 characters long uppercase hex strings for the same purpose. I chose to convert the former to the latter format, resulting in a set of hexadecimal key IDs. Later, I could check, which keys available in the current keyring are able to decrypt the file. The get_acl function thus returns a dict mapping e-mail addresses to a boolean value that indicates the key's ability to decrypt the file specified in the filename parameter. I took apart the headset bundled with the gear, and verified this pinout in case of the Mic/Speaker/PTT lines with a multimeter, so I only had to connect these pins to the notebook. Since I already had an FTDI TTL-232R-5V cable lying around for use with my Diavolino (actually, I won both of them on the LoL shield contest at 27C3), I created a breakout board that can be connected to the radio, and had pin headers just in the right order for the FTDI cable and two others for speaker and mic lines. The schematic and the resulting hardware can be seen below. With the physical layer ready, I only had to find some way to manipulate the radio using software running on the notebook. 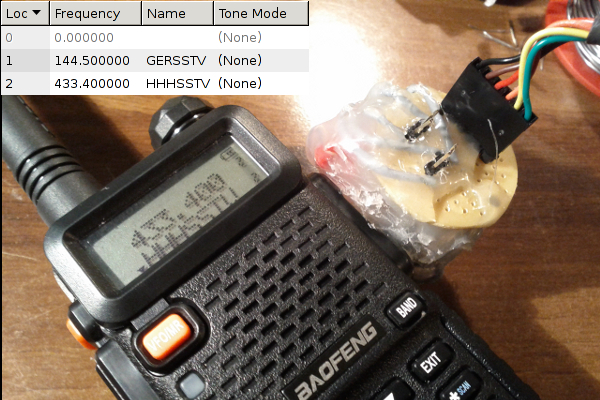 While many software available for this radio is either closed and/or available for Windows only, I found Chirp, a FLOSS solution written in Python (thus available for all sane platforms) which – as of this writing – could access Baofeng UV-5R in the experimental daily builds. Like most Python software, Chirp doesn't require any install procedures either, downloading and extracting the tarball led to a functional and minimalistic GUI. 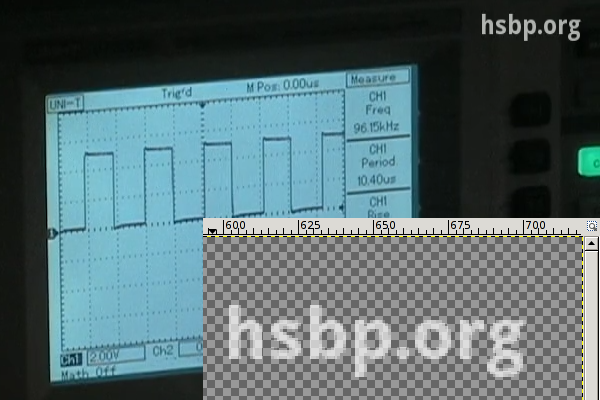 First, I set the second tuner to display the name of the channel, and uploaded a channel list with the Hármashatár-hegy SSTV relay (thus the name HHHSSTV) at position 2, with the following results. I could also access an interesting tab named other settings that made it possible to edit the message displayed upon startup and limit the frequency range in both bands. Although Chirp states that the driver for UV-5R is still experimental, I didn't have any problems with it, and as it's written in Python, its code is readable and extensible, while avoiding cryptic dependencies. It's definitely worth a try, and if lack of PC connectivity without proprietary software was a reason for you to avoid this radio, then I have good news for you. Years ago, there was a competition, where contestants had to extract date out of a system that was protected by a state-of-the-art anti-leaking solution. Such challenges are based on the fact that private information should be available for use on a protected computer, but it must stay within the physical boundaries of the system. Obvious methods like networking and removable storage devices are usually covered by these mechanisms, but as with DRM, it's difficult – if not impossible – to think of every possibility. For example, in the aforementioned challenge, some guys used the audio output to get a file off the box – and when I heard about the Little Wire project, I started thinking about a new vector. that only allows a display, a keyboard and a mouse to be connected. My idea was to use a USB HID device, since these can be connected to such system without additional drivers or special privileges. I've already built such a device for interfacing JTAG using an Arduino clone and V-USB, so I could reuse both hardware and experience, but avoid using an external programmer. 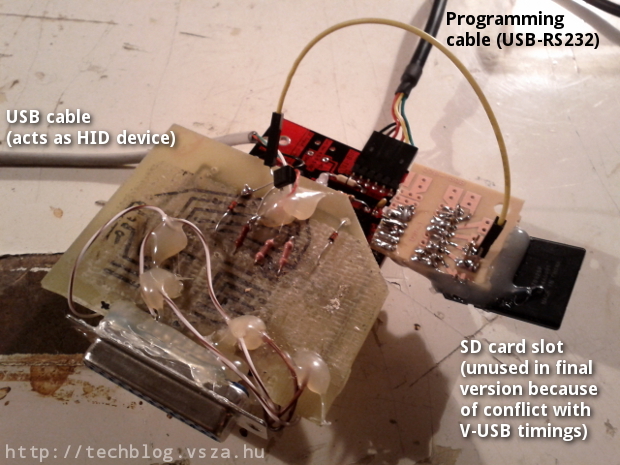 The V-USB library made it possible for me to create an USB device without buying purpose-built hardware, by bit-banging the USB protocol with the general-purpose input and output pins of an AVR ATmega328 microcontroller. When used correctly, the AVR device shows up as a regular keyboard in the Windows 7 devices dialog. Bits were sent from LSB to MSB, n bytes were sent from 0 to n-1, stored at the nth position in the EEPROM. I tried using an SD card to store the data received, but it conflicted with the V-USB library, so I had to use the built-in EEPROM – the MCU I used was the ATmega328, which had 1 kbyte of it, which limited the size of the largest file that could be extracted. Of course, the aforementoned agent had to be placed on the Windows box before transmitting file contents. The problem was similar to using dumb bindshell shellcodes to upload binary content, and most people solved it by using debug.com. Although it's there on most versions of Windows, it has its limitations: the output file can be 64 kilobytes at maximum, and it requires data to be typed using hexadecimal characters, which requires at least two characters per byte. In contrast, base64 requires only 4 characters per 3 bytes (33% overhead instead of 100%), and there's a way to do it on recent Windows systems using a good old friend of ours: Visual Basic. I created a simple VBS skeleton that decodes base64 strings and saves the binary output to a file, and another simple Python script that fills the skeleton base64-encoded content, and also compresses it (like JS and CSS minifiers on the web). The output of the minified version is something like the one below. The result is such a solution that makes it possible to carry a Windows agent (a simple exe program) that can be typed in from the Flash memory of the AVR, which, when executed, can leak any file using the LEDs. 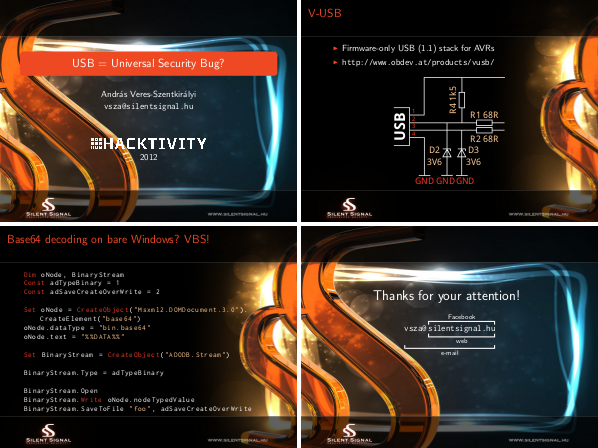 I successfully demonstrated these abilities at Hacktivity 2012, my slideshow is available for download on the Silent Signal homepage, videos should be posted soon. The hardware itself can be seen below, the self-made USB interface shield is the same as the one in the V-USB wiki hardware page. and after deploying the agent, it can read LEDs with 1.24 effective bytes per second. 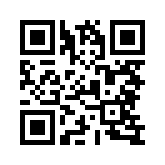 the base64 VBS encoder, written in Python, also released under MIT license. Because of a response I got to my post about using MS Word templates with LaTeX, documenting the way I've been generating presentation material for my talks since 2010 got its priority raised. Like I said in the aforementioned post, I prefer using LaTeX for typesetting, and it's the same for creating those frames that appear behind my back during talks. For the first few talks, I used the default template, then I switched to the Warsaw theme, which I frequently encounter in the beamer-using subset of IT security presenters. In 2011, Lasky – the graphics genius around Silent Signal – designed a presentation template that I actually liked, so I started fiddling with beamer to adapt the new theme. First, I created a file called s2beamer.sty with the usual header, and two lines that set a sensible base. I had to disable shadow, since it couldn't handle setting background images, as it assumed that the background was a solid color. The theme I used included a separate background image for the title slide, and another for the rest (the ones with actual content), so I defined a command to create a title slide, which sets the background before and after the first frame. I added newlines only for readability, they must be removed or commented in the .sty file. After setting the background, the colors needed to be changed too. First, I set the color of the body text and structural elements (such as list bullets). The color of the frame titles was set to the same orangeish one. The default list bullets are actual bullets, which looked bad on the background image, so I changed them to little arrows. Also, I hid the navigation controls (placed in the lower-right corner) since they conflicted with the footer of the theme, and most people doesn't even know what they're for. URLs and code snippets are written using fixed-size fonts (as they should be), but I prefer using Inconsolata for this purpose, instead of the default. In case of code snippets, I prefer using the listings package, and I configured it to use such colors for syntax highlighting that go well with the theme (newline added in case of the last line for readability only). Since I give talks both in English and Hungarian, I added the following expression to set the order of first and last name according to babel language set by the document. (The \hunnexlabel command is defined when the babel language is set to magyar.) It also turns the e-mail address into a hyperlink that launches the default e-mail client when clicked on. With these all set, I can create presentation material that look awesome but are still generated from plain text, thus compatible with all sensible editors and SCMs. You can see the snippets above in action by taking a look at my Hacktivity 2012 slides (four of them are below this paragraph), and some of them in the ones I made for Hacktivity 2011. Last week, I tried to measure the entropy of the session ID of an SSL/TLS-wrapped web application. I prefer Burp Suite Pro for such tasks, but in this case, it could only gather 5 to 10 session IDs per second. I fired up Wireshark and found that it didn't reuse the SSL/TLS context, but opened a new TCP socket and performed handshake for every new session, even though the HTTP server set the Connection header to keep-alive. Since collecting session IDs is not exactly rocket science, I decided that it's faster to roll my own solution instead of waiting for the dead slow Burp sequencer. First, I put a simple HTTP request into a text file, carefully ending the lines Windows-style (\r\n) and putting an empty line at the end. I used HEAD so that I could minimize the latency and server load by keeping the server from sending me the actual contents (the session ID got sent in a Set-Cookie header anyways). First, I sent as many requests as I could, completely disregarding the answers. 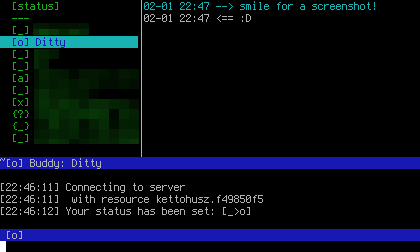 As it turned out, the server stopped responding after around 100 requests, so I simply reduced the number of requests per connection to 100, and put the whole thing into a while loop, so that it would keep opening new SSL/TLS connections after every 100 requests. I also added a simple sed invocation so that the result can be directly used by Burp for analysis. In another terminal, I started watch -n1 'wc -l cookies.txt', so I also had a sense of progress, as the above shell 1-liner produced the 20000 tokens required by FIPS in a matter of minutes. From time to time, I hear it from low-level coder monkeys posing as either tech gurus or teachers that using the shift operators (<< and >> in C syntax) instead of multiplication and division in cases when the factor/divisor is an integer power of 2 results in faster code. While I've always been skeptical about such speculations – and I've been reassured several times by many sources, including MSDN forums and Stack Overflow – I haven't tried it for myself, especially in managed languages such as C# that are compiled to a byte code first. Although Mono is not the reference implementation of C# and the .Net virtual machine, it's the one that runs on my notebook and allows for easy static compilation which makes it possible for me to inspect the machine code generated from the .Net executable file. First, I wrote a simple program that reads a byte from the standard input, divides it by 2, and writes the result to the standard output (mainly to avoid optimization that would replace division with compile-time evaluation). I compiled it with the Mono C# compiler and verified that it works (T = 84 in ASCII). Dumping the .Net bytecode reveals that the first pass of compilation uses division. Finally, transforming the bytecode into machine code assures us again that premature optimization is the root of all evil, as the code executed by the CPU at runtime contains the good old shift right (shr) opcode. JIT time: 0 ms, Generation time: 0 ms, Assembly+Link time: 0 ms.